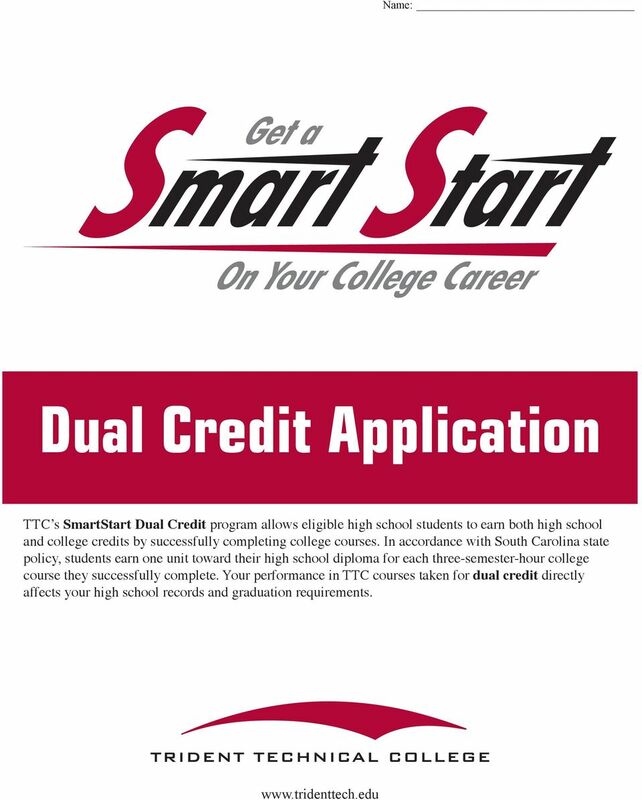 1 Name: Dual Credit Application TTC s SmartStart Dual Credit program allows eligible high school students to earn both high school and college credits by successfully completing college courses. In accordance with South Carolina state policy, students earn one unit toward their high school diploma for each three-semester-hour college course they successfully complete. 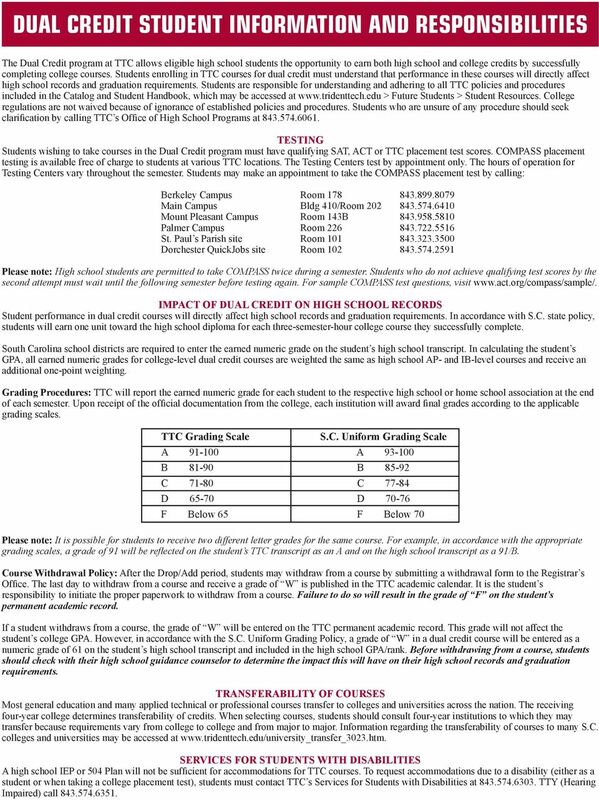 Your performance in TTC courses taken for dual credit directly affects your high school records and graduation requirements. 2 , 20 Anticipated High School Graduation Student Information The following information will be kept by the Dual Credit office for tracking purposes. Name Last First Middle Initial Address Home Phone Cell Phone Gender Race Date of Birth Age *Social Security Number Name of Next of Kin Last First Middle Initial Relationship Home Phone Cell Phone Address *High School Attending Student SignatureDate Parent/Guardian Signature Date Courses Requested *Required CONFIDENTIALITY OF STUDENT RECORDS TTC complies fully with the Family Educational Rights and Privacy Act of This law guarantees the privacy of student educational records and protects the student s right to access those records. Visit for more information regarding FERPA and how TTC complies with the law. Please note: Because Dual Credit students are completing courses that will affect their high school transcripts, parents, high school guidance counselors and administrators have the right to information regarding the students course work and attendance. Requests for information regarding a student s academic success or records must be made in writing to the instructor or to the Office of High School Programs. NOTICE OF NON-DISCRIMINATION Trident Technical College does not discriminate in admission or employment on the basis of race, gender, color, national or ethnic origin, age, religion, disability, marital status, veteran status, sexual orientation or gender identity. CAMPUS SECURITY Please visit for information concerning: 1) crime prevention policies; 2) crime and related statistics; 3) TTC s sexual assault policy. 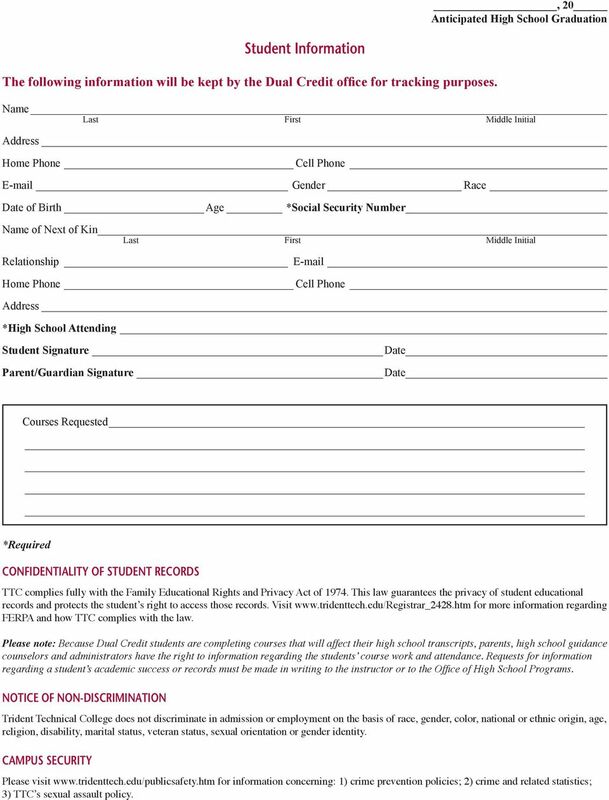 3 Dual Credit Application (Complete fully with student information. Incomplete information will delay your application.) *Social Security number Prefix: o Mr. o Ms. Name Last First Middle Initial Suffix Address Street or P.O. Box Apt. No. City State Zip Code County Home phone ( ) Work phone ( ) Work ext. Date of birth / / Month Day Year Ethnicity Are you Hispanic/Latino? 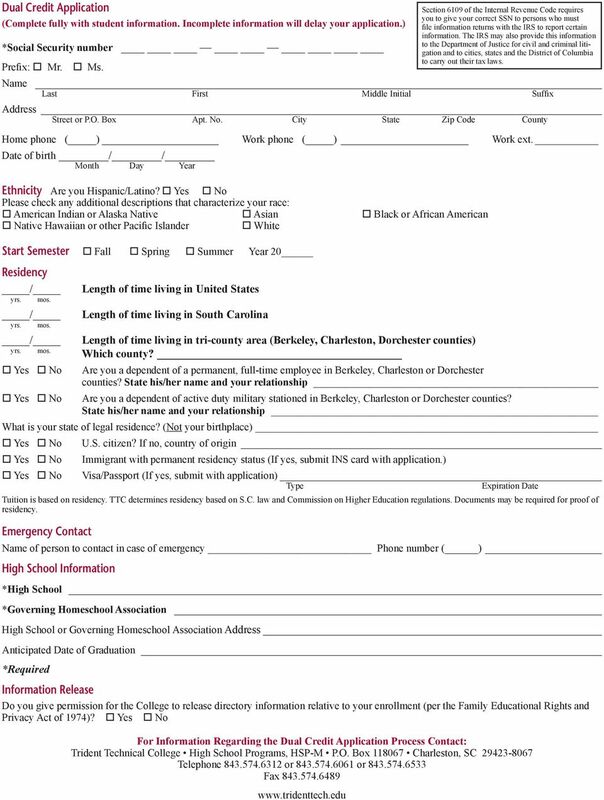 Please check any additional descriptions that characterize your race: o American Indian or Alaska Native o Asian o Black or African American o Native Hawaiian or other Pacific Islander o White Start Semester o Fall o Spring o Summer Year 20 Residency / yrs. mos. / yrs. mos. Length of time living in United States Length of time living in South Carolina / Length of time living in tri-county area (Berkeley, Charleston, Dorchester counties) yrs. mos. Which county? Are you a dependent of a permanent, full-time employee in Berkeley, Charleston or Dorchester counties? State his/her name and your relationship Are you a dependent of active duty military stationed in Berkeley, Charleston or Dorchester counties? State his/her name and your relationship What is your state of legal residence? (Not your birthplace) U.S. citizen? If no, country of origin Immigrant with permanent residency status (If yes, submit INS card with application.) Visa/Passport (If yes, submit with application) Type Expiration Date Tuition is based on residency. TTC determines residency based on S.C. law and Commission on Higher Education regulations. Documents may be required for proof of residency. Emergency Contact Name of person to contact in case of emergency Phone number ( ) High School Information *High School *Governing Homeschool Association High School or Governing Homeschool Association Address Anticipated Date of Graduation *Required Information Release Do you give permission for the College to release directory information relative to your enrollment (per the Family Educational Rights and Privacy Act of 1974)? 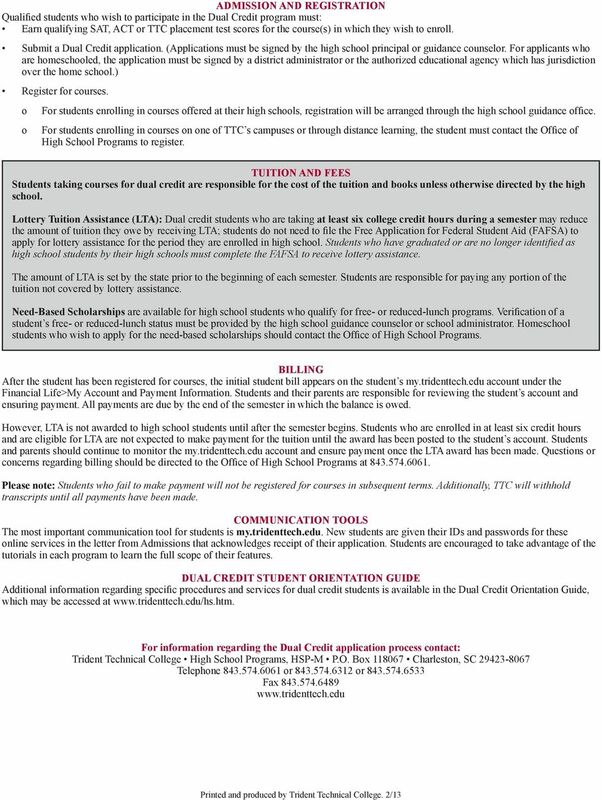 For Information Regarding the Dual Credit Application Process Contact: Trident Technical College High School Programs, HSP-M P.O. Box Charleston, SC Telephone or or Fax Section 6109 of the Internal Revenue Code requires you to give your correct SSN to persons who must file information returns with the IRS to report certain information. The IRS may also provide this information to the Department of Justice for civil and criminal litigation and to cities, states and the District of Columbia to carry out their tax laws. 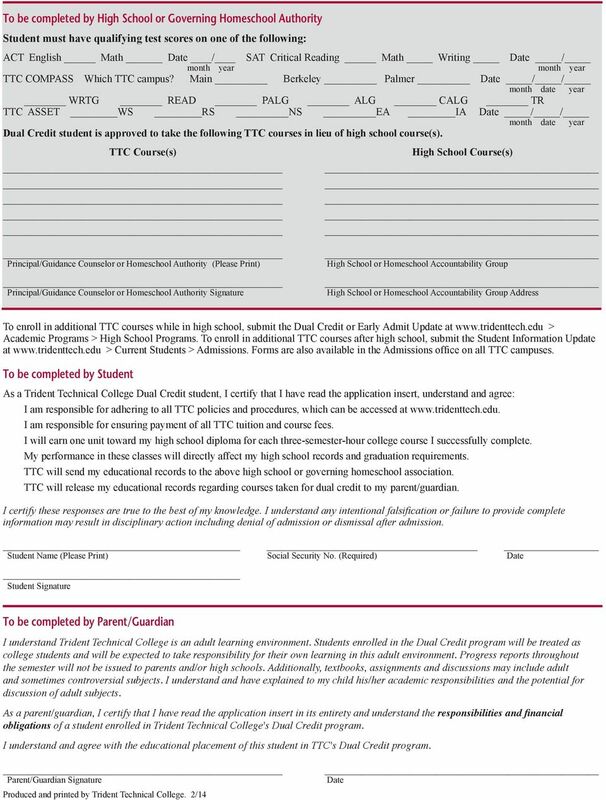 Dual Credit Handbook 2015-2016 www.tridenttech.edu Table of Contents Section 1 Welcome and Introduction Welcome... 2 TTC Mission Statement 2 Dual Credit Overview 2 Confidentiality of Student Records.. PROGRAM APPLICATION FOR GATEWAY TO COLLEGE ADMISSION Please read the entire application carefully before completing. Print clearly. Use a black or blue ink pen. Only complete applications will be considered.